After receiving more than 3,000 comments about proposed log fumigation facilities in eastern North Carolina, state officials are asking the Environmental Management Commission to pass new rules on emissions of methyl bromide, the toxic chemical used in that process. If the EMC agrees, the rules would be the first in North Carolina to specifically regulate methyl bromide. There are no federal or state air quality regulations to protect the public from methyl bromide emissions, according to the Division of Air Quality. The EMC will hear the proposal at a special meeting Wednesday at 10 a.m. in the Archdale Building in Raleigh. The first portion of the meeting will be devoted to a special consent order regarding illegal seeps of coal ash contamination from Duke Energy’s Roxboro and Mayo plants in Person County. The meeting will have an audio stream; the password is 1234. A hazardous air pollutant, methyl bromide has been largely banned internationally because it depletes the ozone layer and can harm the nervous system in humans. However, the chemical has received a critical use exemption to treat logs and crops for import and export. Last year, Tima Capital had submitted a permit application to emit 60 tons a year from an operation near Wilmington; it withdrew the request after the Department of Environmental Quality received more than 2,000 comments. And earlier this year, Malec Brothers, based in Australia, proposed an even larger operation — 100 to 140 tons of annual emissions — near the small towns of Delco and Riegelwood in Columbus County. In its permit application, the company proposed using sandbags and duct tape to control emissions leaving the fumigation containers. DAQ received more than 1,000 comments and held two public hearings, at which residents demanded that state environmental officials strengthen rules on methyl bromide. A third new log fumigation facility has also been proposed by Royal Pest Solutions for Halifax County, northeast of Scotland Neck. All pending methyl bromide permits are on hold; DAQ has notified existing facilities that it plans to modify their permits. 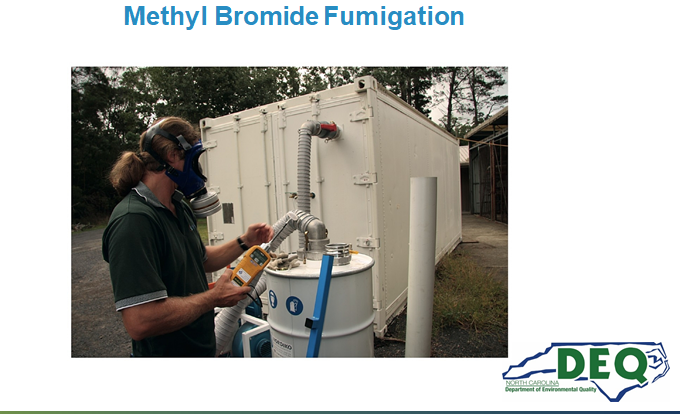 DAQ Director Mike Abraczinskas noted in a PowerPoint presentation that unlike agricultural uses, in which methyl bromide has been used to kill pests over large farm tracts, these log fumigation operations concentrate the emissions in one spot. The new proposed rule would establish control requirements for all hazardous and toxic air pollutants from all existing, new or modified log fumigation operations. A draft of the proposed temporary rule will go to the EMC next month; it will be subject to public comment and a public hearing. In addition, DEQ has asked the state Science Advisory Board to evaluate inhalation risks of methyl bromide and to recommend an acceptable level of it in the air. The temporary rule could go into effect as early as December. Next year, a permanent rule, which has its own public comment and hearing period, could become effective in July. DEQ also is sending a letter to the EPA asking that log fumigation facilities that use methyl bromide be required to be equipped with stringent emissions controls — Maximum Achievable Control Technology. This requirement is known as a Section 112(g) classification under the Clean Air Act; it applies to industrial sources that emit 10 or more tons of one pollutant or 25 tons or more of a combination of pollutants. no live stream on todays meeting.